Hi Blog Buddies! I hope you've had a great week! I've been without the internet for an entire week and have literally and figuratively felt so disconnected from the world! I've missed you guys! Bear with me while I catch up on your blog posts! Last week I had planned to do another 2 posts, but was obviously unable to. So now that the internet is working again, I've decided to combine them and include 5 new different colourful outfits in this one mega post! I wore this outfit a few weeks ago when we visited the aquarium. I dressed for the occasion by wearing different shades of blue and accessorising with my jellyfish earrings! I love these earrings! They are just so fun to wear! Well, thankfully, my internet is up and running again now! Yay! I hate to be without it, especially since discovering the wonderful world of blogging! As summer continues on, so does my wearing of bright and bold colours! I really have embraced wearing colour again this summer and have rarely worn my old default black top with every skirt/pants. For the most part anyway, black just looks and feels too hot in this weather and frankly, just isn't as fun as wearing bright colours! 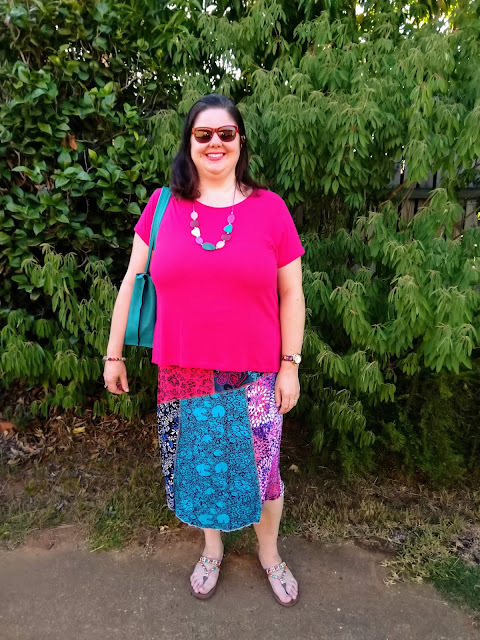 In the first outfit, I paired my multi-print skirt with my hot pink top. For someone who used to be afraid of wearing colour on top (for fear it drew too much attention to my bust), I sure have had quite a lot of wear out of this hot pink top! In fact, I'm pretty sure that hot pink is as far from black as possible! 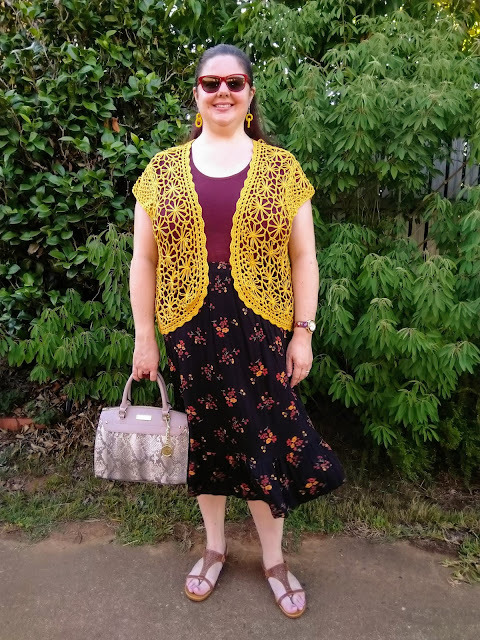 As for my fear of drawing attention to my big bust and stomach, well, even if I wear black they're still big, so why not just enjoy wearing bright colours anyway? Right? Paisley would have to be my favourite pattern of all. It's teardrop shape is instantly recognisable and this pattern has a long and fascinating history. 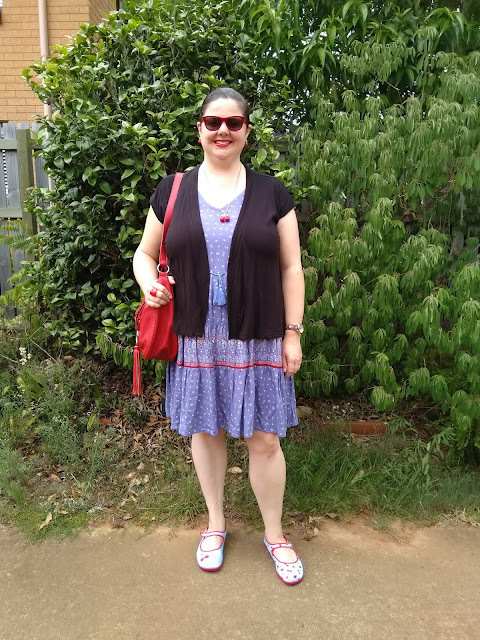 Before I started this blog, I didn't really know anything about the history or evolution of fashion, but now I'm keen to know more about what I'm wearing and the history behind it. I found an interesting article about paisley, that you can read here, if you're interested! 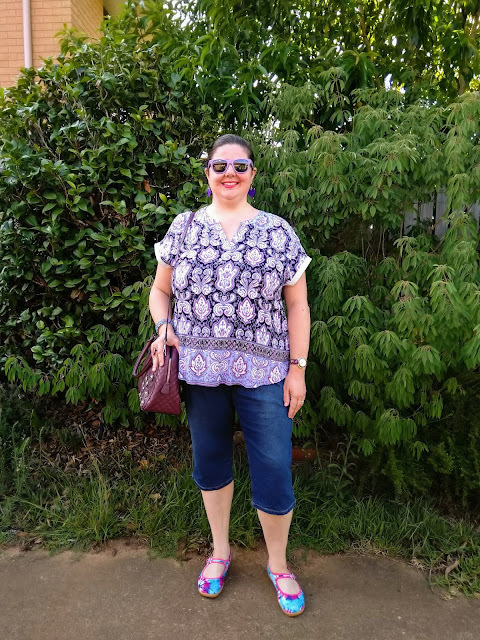 There are many paisley patterns in my wardrobe, adorning tops, skirts, pants and even shoes! As well as its interesting history, I just think it is such a fun and timeless pattern. I will never tire of wearing paisley, as it can be styled in so many ways! 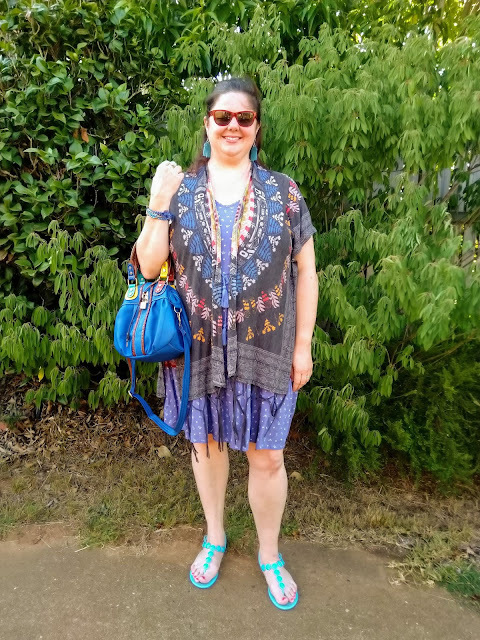 I like wearing it in boho inspired ways, but it can be dressed up too! I've been wearing a lot of dresses this summer, which is quite unusual for me! As I've mentioned before, I don't own many dresses and rarely wear them. With the hot weather though, dresses are an easy and cool choice. As you also know, I love fun and quirky accessories and summer seems like the best time to play around with them! In the first outfit, I decided to accessorise with cherries! Cherry earrings, cherry necklace and cherry shoes, to be exact! In the second outfit, I went with some cute kitty accessories: earrings and ring. It's so fun playing around with different accessories, isn't it? !